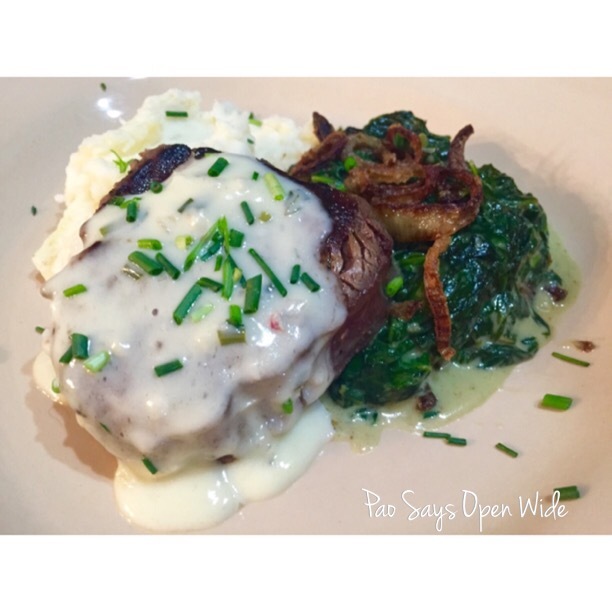 So Fancy: Filet Mignon with Truffled Beurre Blanc – Pao Says, "Open Wide!" Hey guys! I know I have been MIA for a while, so let me explain why as I update you on the recent happenings in my life. In the past month, I have gone to my sister’s graduation from her Masters in Science of Finance program at Vanderbilt, I’ve finished up my prerequisites, gone to two formals, GRADUATED FROM DENTAL SCHOOL (!!! Woop woop- D.D.S. in the house! ), moved from NY to DC, been a part of our best friends’ flash mob engagement in central park, gone to visit my family in Florida, and started my first job as a general dentist. To say I have been busy is an understatement. But, just because I haven’t been posting, doesn’t mean I haven’t been cooking… just ask my family! While I was home, I made a killer filet mignon with a truffled beurre blanc sauce, olive oil mashed potatoes (with the help of my sister, Vanessa… who is also a good cook, I’ll have you know 😉 ), and creamed spinach. My creamed spinach recipe can be found HERE. The only thing I did differently for the spinach was that I added some crispy fried shallots over the top. To make those, I just sliced up some shallots into rings, tossed them in a mixture of cornstarch, salt, and pepper, and then lightly fried them in some olive oil until golden brown. Then, I set them aside on a rack to cool and crisp up (make sure they’re not over-crowded, because they’ll just get soggy). Reduce the wine, shallots, 1/2 of the chives, and garlic by half over medium heat. Add/mix in the cream and reduce by half again. Whisk in the butter a few tablespoons at a time (about half a stick at a time, whisked until completely melted), and then add in the truffle oil. Salt and pepper to taste. 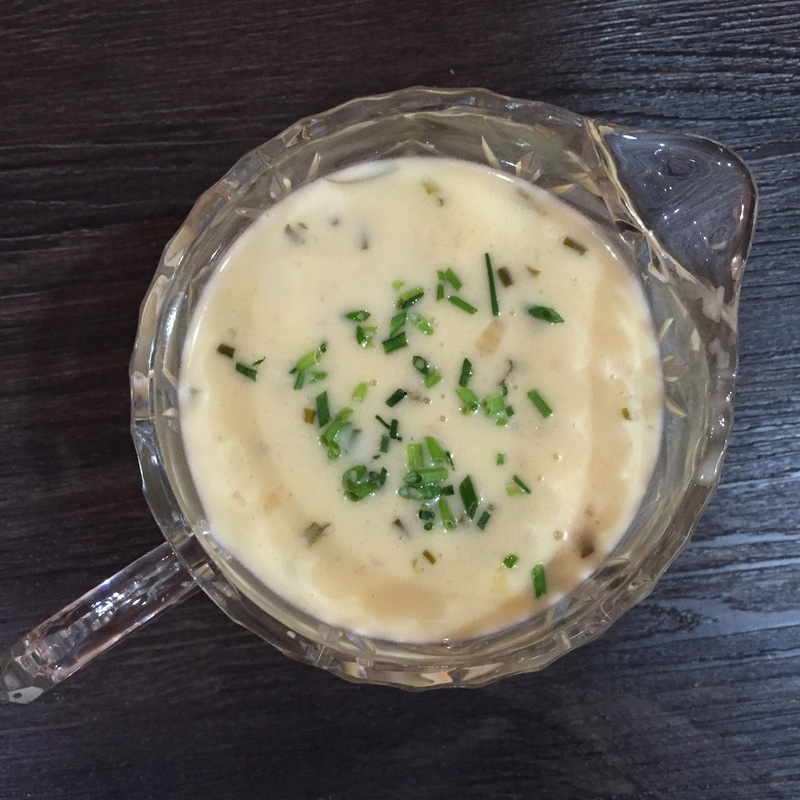 Sprinkle the remaining fresh chives over the top for garnish. Thats it! First, I took my cast iron skillet (cast iron is pretty necessary for this to turn out perfectly- it sears like no other pans I’ve tried), and placed it in a 500 degree oven for about 20 minutes- to make sure its screaming hot. While that came up to temp, I dried off the filets and brushed all sides with a light layer of olive oil. I then seasoned all sides with salt, pepper, and garlic powder. Once the pan was ready, I took it out of the oven, and placed it on a burner over high heat. I cooked the filets for about a minute each side (place them in the pan, and don’t touch them until they are ready to flip), and then I popped the filets back into the 500 degree oven for about 3-4 minutes on one side, then flipped them and left them in for another 3-4 minutes. Then I carefully removed the skillet from the oven and let the filets rest for 8-10 minutes. This gave me a medium-rare cook temp. With a good filet, less is more. Don’t over-season or anything… a good piece of meat speaks for itself. I like the truffled beurre blanc sauce with this filet because it is a super delicate sauce that doesn’t take away from the meat, itself. It was amazing!!! the filet was so tender and delicate, and matched perfectly with those mash potatoes and cream spinach. The best was the truffled sauce on top of the filet!!! we wish you a lot of success!! Congrats on the graduation! You clearly didn’t miss a beat – you are KILLIN IT with this filet 🙂 Rock on !